As of January 2018, China has placed a strict ban on the import of plastic waste. This has had a huge impact to the world, and particularly to Britain. Why, you ask? Well, prior to the ban, Britain exported around 500,000 tons of plastic per year to China. In the past, China was happy to receive the waste material, as it could be recycled and used as part of its industry expansion. According to The Telegraph, China used 7.3 million tons of plastic waste in 2016, which was enough recycled plastic to constitute half of the world’s usage. But, between concerns for the environment and growing issues with contaminated plastic waste being sent over to China, the country has drawn a line and is now refusing to be the world’s landfill. Countries are being forced to look at alternatives to deal with their plastic waste. But what can Britain do to handle its own plastic problem? Reconomy, an expert waste management service who offer safe and compliant hazardous waste skip hire services, explores the issues Britain faces without China’s custom, and the impact of our plastic tide. You might be wondering why Britain is having such a problem in the wake of China’s ban on plastic waste imports. The Telegraph answered this in a recent report on the ban: leaders in the recycling sector have admitted they haven’t a clue how to go about dealing with the ban and its resulting plastic backlog. Britain is woefully lacking in its own ability to recycle plastics – we simply do not have the facilities in place to do so to the level that China can. Hence, we sent our plastic waste abroad to be recycled. But, as the Daily Mail revealed, even though Britain has been shipping its plastics abroad to be “recycled” and counting it towards its yearly goal, the amount of plastic actually being recycled is a different story. Much of our exported plastic waste is contaminated, dirty, or mixed with other waste not labelled on the container. As such, with the contaminated plastic batches being too costly to sort and recycle, they often end up on a landfill. The country has, essentially, been throwing plastic onto a landfill elsewhere, and calling it “recycled”. It’s understandable then that China no longer wants to deal with the world’s mishandled plastic waste. But, without the facilities in place to recycle it ourselves, what can we do? One solution proposed is to look to other countries to export our waste to. Although no one has the recycling capabilities that China presented for plastic waste, places such a Vietnam could pick up some of the business. But, with the issue being down to our own poor handling of the exported material, would it be a matter of time before other countries followed China’s lead and banned the import of plastic waste too? After all, the issue would still stand that the plastic waste being sent over is not what was promised, leaving another country to deal with unusable plastic. As far as at-home solutions go, Britain is facing a crisis. 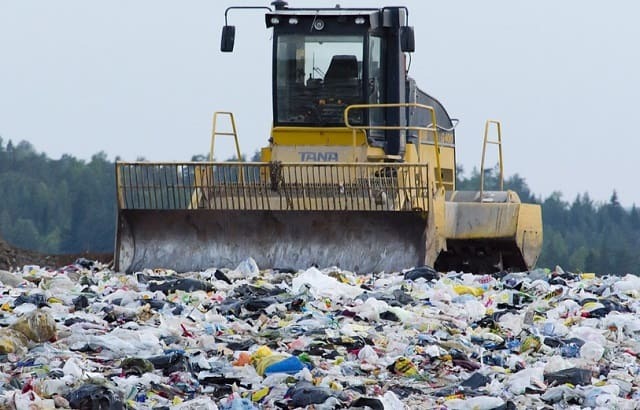 Without the necessary resources to recycle such a scale of plastic on home turf, it looks like most of our plastic waste will end up back on landfills or incinerated. Incineration is a problem all of its own: as The Telegraph warns, scientists have noted the issues of burning plastics. Pollutants like dioxin and hydrogen chloride are released upon incinerating plastics. Also, tiny particulates are dispersed too. These can all contribute towards environmental and health issues. An example of this was found in a new study described by The Independent. The study took a sample of mussels from Britain’s coastlines and supermarkets, and they were tested for plastic traces and other debris. Mussels are a good way to sample the ocean’s water, as they filter-feed, meaning they can consume other particles from the water other than their intended food. The results of the study made for a shocking read: every single one of the mussels sampled were found to contain plastic shards or other fragments. And if our food is eating it, we’re eating it too. Although the risk or lack thereof is yet to be confirmed, it is still an awful result that drives home just how much plastic is flooding our lives. Now more than ever, Britain needs to look at how to lower its plastic usage and reuse the plastic we already generate. Supermarket chain Morrison’s has recently made the news as they reintroduced the classic paper bag for fruit and vegetables, replacing the usual small plastic bags on offer. The Metro says the shop hopes the change will reduce the amount of small plastic bags being used by more than 150 million per year. Many news outlets have also spoken about the now-global war on plastic straws, with industry giant McDonald’s ending its use of plastic straws in favour of environmentally-friendly paper straws. In fact, The Guardian was pleased to show that the move is re-introducing a business Britain has not seen for several decades, as a paper straw factory is set to open in Wales to supply McDonald’s. Plus, as of January 2018, Britain banned microbeads entirely. These tiny little plastic particles were found in many cosmetics and cleaning products. But Global Citizen pointed out a loophole in the ban that means leave-on products, such as make-up, are still exempt from the ban. The 5p ban on plastic bags has become fairly mainstream across Britain, but in England, some stores are excused if they have less than 250 employees. This could soon be changing to encompass all stores regardless of their size. Can Britain do more to handle its plastic waste? With the looming backlog of plastic upon us, now more than ever it is important for us to look at our use of plastic and how we can use alternatives. It is not merely a case of finding somewhere else to landfill our plastics – it is the responsibility of us all to reuse and recycle plastics wherever possible. I hope you enjoyed this article about the UK's relationship with China with regards to plastic waste and recycling programs. Interested in more articles about ?